There’s a new game developed and offered for all of you guys, who love any kind of casino poker variation. 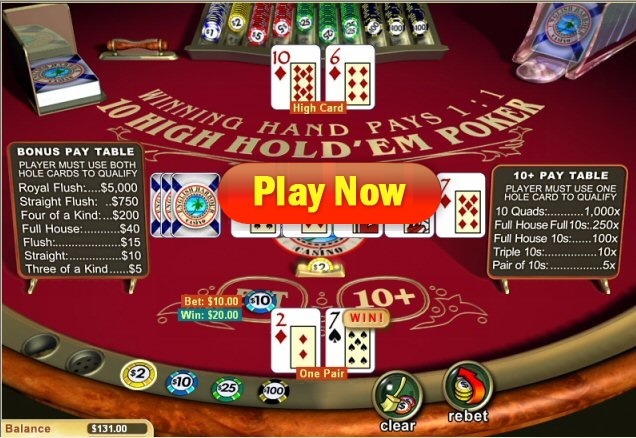 10 High Holdem can be played at all WGS Technology Casinos, and features a couple of interesting concepts that, I though, are worth sharing. To summarise it, this game is similar to the so called club hold’em poker, which is played between people. While this isn’t the case with this game, it does happen to have a whole lot of similar with that variation, though. Hands are valued the same way, you’ll also get two hole cards and 5 cards will be dealt on the board. Lets take a step by step look on how this game is played. Regular Bet ”ante” – simple wager, which is a prediction that your hand will be better than the dealers, when the river is dealt. At least one of your hole cards have to be used, when forming the winning combination. Bonus Bet – a fixed $2 denomination wager. You’ll have to use both hole cards, when forming the winning combination and it will need to be equal or better than three of a kind in strength. Once you’ve decided about the wagers you are looking to make, it’s time for hitting the deal button and moving on to the gameplay. If you’re an experienced punter, you’ve probably seen a bunch of complicated games and ones that require you to think and make additional descriptions while the hands go on. Well, 10 High Holdem certainly isn’t one of those, as once you’ve decided about the size and type of your wager, you only have to watch how the cards are dealt. That’s right – all five cards will be dealt and you won’t have to do anything other than root for your hand to beat the dealers. After all cards are dealt, the winner is determined. If you’re the lucky one, you will get a payout of even money for the initial, ”ante” wager while the two other bets will be paid according to the pay-table, should they qualify. There are two separate pay-tables – one for the 10+ bet and other for the $2 bonus wager. Remember: Both hole cards have to be used, to earn a 10+ bonus bet payout. Not all that much strategy can be given for playing 10 High Holdem, but a couple of tips can. Firstly, try to manage your money carefully. Of course, you are playing gambling games that have a set house advantage, but that does not mean you shouldn’t practice bankroll management. Use a betsize that will allow you to play for a while, even if you happen to run bad and hit a really horrible streak. Also, the 10+ bet, while really generous in payouts is a bit of a longshot. If you don’t care and all you are looking for is thrill, excitement and a chance to win a payout of up to 2,000 to 1. You’re all set for having the time of your life, well at least the best experience playing casino games online for sure! I would suggest to play this casino poker game at Gaming Club Casino they offer a100% match bonuses, up to $100 plus 30 free slot spins! That’s 30 free spins totally free waiting for you! CLICK HERE to Join Now!